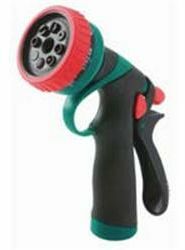 Poly pistol grip nozzle. 8 spray patterns. Hold open button for continuous spraying. Molded grip for cushioned comfort. Handle loop for easy storage. Hold open button for continuous spraying. Poly pistol grip nozzle. 8 spray patterns. Hold open button for continuous spraying. Molded grip for cushioned comfort.